It has come to my attention that often times when booking trips through online services, the email confirmations can have identical subjects for different trips. 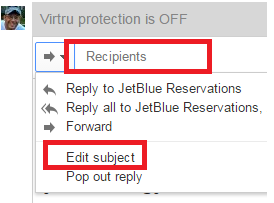 This causes a problem due to conversation threading in Inbox by Gmail. All of the confirmations with the same subject line will create one trip instead of a separate trip for each confirmation. Choose the first email you want to create a trip for and forward that email. Hope you all find this helpful.